*APR = Annual Percentage Rate. All loans subject to credit approval. Rates, terms and conditions are subject to change and may vary based on credit worthiness, qualifications and collateral conditions. 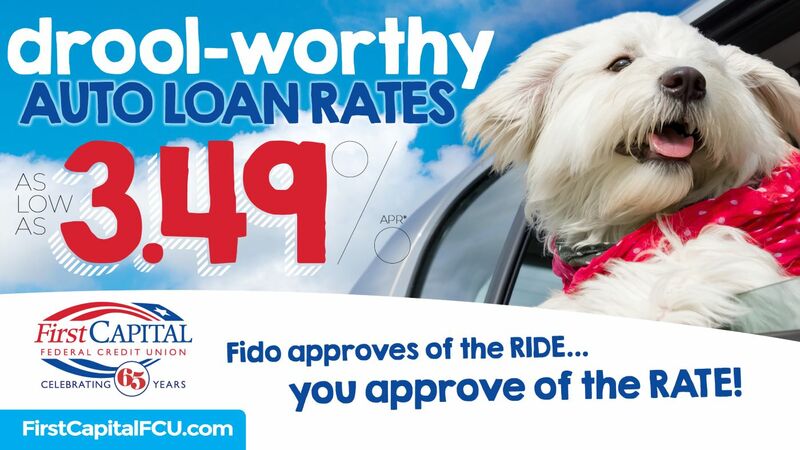 Estimated monthly payment of $22.36 per $1000.00 borrowed at 3.49% APR for 48 months. Loan terms will be up to a maximum term of 84 months. Maximum loan to value of 115%. Cannot be combined with any other offer other than the First Capital Star Rewards® 3-Star discount. Effective April 1 – June 30, 2019. *APR = Annual Percentage Rate. All loans subject to credit approval. 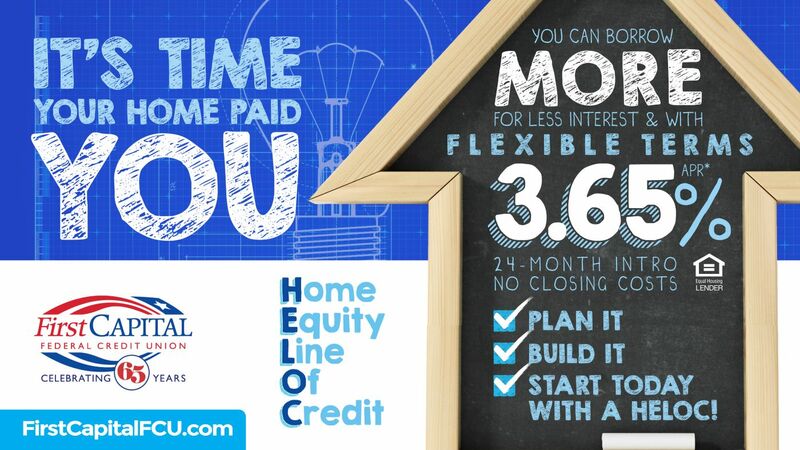 3.65% APR applies for 24 months upon loan closing. After 24-months, any remaining balance plus subsequent advances are subject to a standard variable APR, which is the monthly average of the Six-Month Treasury Bill Rate plus a margin of 3.50% and can adjust quarterly. Rates current as of April 1, 2019. Minimum Loan amount is $10,000. Maximum Loan to Value (LTV) is 80%. First Capital will pay all closing and appraisal costs. Additional fees may apply. Property insurance required; flood insurance may be required. Consult with your tax advisor on possible tax benefits. Applicable to owner-occupied primary residence only in a first or second lien position. Minimum advance of $100. The monthly payment may vary based on loan balance and interest rate fluctuation. 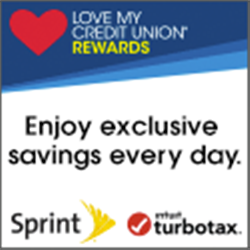 First Capital reserves the right to end this promotional rate at any time. New money only. The introductory APR will terminate at the end of the 24- month introductory period, no notice required. Maximum rate cannot exceed 18%. Certain additional restrictions may apply. Other home loan products, rates, and terms available. 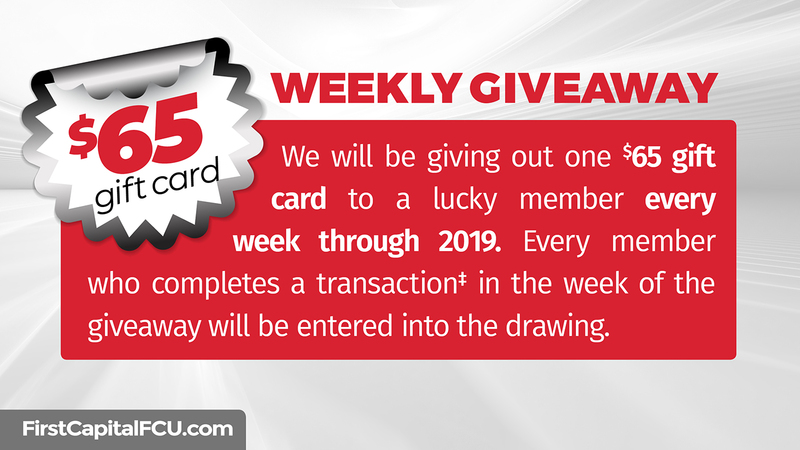 Offer valid April 1 – June 30, 2019. *APR = Annual Percentage Rate. 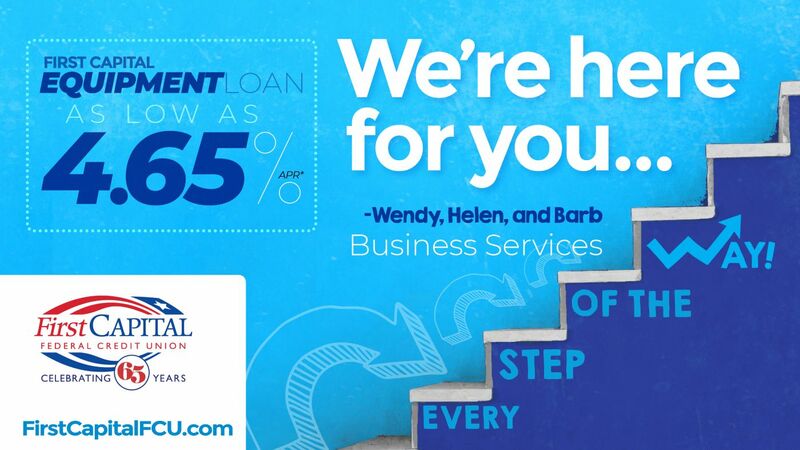 All loans subject to credit approval. Rates, terms and conditions are subject to change and may vary based on credit worthiness, qualifications and collateral conditions. Offer valid April 1 – June 30, 2019. ‡Official Promotion Details and Rules can be found here.